The Chevrolet Trax is a model introduced to the UK by GM in 2013 which aims to take on the compact SUV market and ideally conquer it thanks to some clever design choices and plenty of modern features. The Trax got its first public showing during the Paris Auto Show in 2012 and it was launched in Canada and Mexico before the end of the year, ahead of its European debut. Chevrolet is basically hoping to steal some sales from the Nissan Juke and the Trax is bigger in just about every direction than its closest rival. That helps to enhance its practicality and presence on the road and you'll see an equivalent model from Vauxhall, called the Mokka, arriving in the near future as well. There are two different trim options available for the Chevrolet Trax. The first is the LS, which bundles various standard features into one appealing package. The LS includes 16 inch alloys, air con, parking sensors on the rear bumper, headlamps which automatically illuminate and a decent audio system that includes Bluetooth connectivity and USB drive compatibility. The higher end Trax LT adds 18 inch alloys to the mix, as well as a parking camera mounted at the rear and the advanced Chevrolet MyLink onboard computer that makes it easier to manage all of the gadgetry. With the Trax LT you can opt for an all-wheel drive iteration if you want to make it a bit more of an off-roader than the standard 2WD setup. A 1.6 litre petrol engine with a five speed manual gearbox is the basic arrangement for the Trax range. There are 1.7 litre diesel engines and also a turbocharged 1.4 litre petrol model with AWD enabled that offers the most power. On the outside the used Chevrolet Trax is a chunky hunk, with a commanding grill and a bulky back end. Four doors allow for easy access to the roomy interior and the rear hatch opens up to reveal a 356 litre boot. All of the passenger seats fold flat to the floor, including the one up front next to the driver, which helps to make the Trax a very versatile and practical model. There are also loads of storage compartments onboard, making it a decent family choice. While there is no solid information relating to the Chevrolet Trax at the moment, it is expected to enter the UK market at around £14,000 or below for the base model. This makes it quite an affordable option in its category, while fuel economy should help to make it cheap to run. This is a compact SUV, not a full off-roader, so it's probably advisable to stick to the tarmac if you're buying new to avoid any unwanted scrapes and bumps. When the Trax eventually hits the used market you will need to watch out for normal wear and tear. The Trax should benefit from competitively priced components since it is manufactured by a major company that is known for affordability. 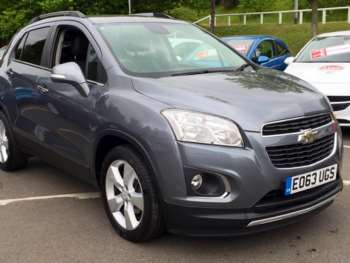 Many sources have called the Trax the best car that Chevrolet sells in the UK, which is a pretty impressive accolade even if this manufacturer isn't one of the biggest names on the roads of Blighty. Road tests suggest that the Trax performs well, with only the moderately vague feel of the handling causing motoring journalists any concern. Arguably the best engine to go for is the 1.4 litre turbo, because it manages to offer decent performance with a 0-60mph time of less than 10 seconds while still giving you almost 45mph. The 1.7 litre diesel is a little more frugal, with plenty of torque available, while even the 116bhp 1.6 litre petrol model is not to be ignored. With all of the technology and driver aids onboard, you'll barely need to think when driving the Trax. It's got hill start assist for those who have to park and set off from tricky inclines, while the presence of parking sensors on even the basic model will be welcomed by those who often end up with a cracked bumped and a bruised ego when trying to get into a tight space.